Two skeletons, thought to be from different early hominin species, are actually from the same species, report anthropologists. 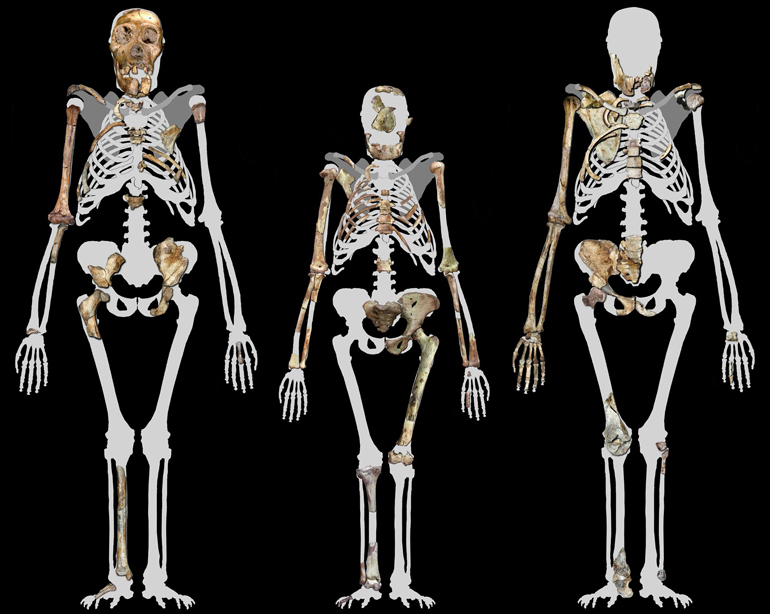 The fossil site of Malapa in the Cradle of Humankind, South Africa yielded two partial skeletons: a juvenile male individual—Malapa Hominin 1 (MH1)—and an adult female (MH2); each is more complete than the famous “Lucy” specimen from Ethiopia. Lee Berger, a professor in the Evolutionary Studies Institute at the University of the Witwatersrand in South Africa, discovered Malapa and, with colleagues, dated the site to just under two million years old. They named a new hominin species, Australopithecus sediba, based on MH1 and MH2. Over the past decade, researchers have been piecing together these skeletons; the culmination of their work appears in PaleoAnthropology, which New York University anthropologist Scott Williams and Dartmouth College anthropologist Jeremy DeSilva co-edited. The special issue contains nine papers, which analyze 135 fossils and outline A. sediba’s skull, vertebral column, thorax, pelvis, upper limb, hand, and lower limb, as well as its body proportions and walking mechanics. The papers conclude that A. sediba is a unique species distinct from both A. africanus, with which it shares a close geographic proximity, and from early members of the genus Homo (e.g., H. habilis) in both East and South Africa, but that it shares features with both groups, suggesting a close evolutionary relationship. “Our interpretations in the papers suggest that A. sediba was adapted to terrestrial bipedalism, but also spent significant time climbing in trees, perhaps for foraging and protection from predators,” says Williams, whose research in the issue centered on the axial skeleton (vertebrae, ribs, and sternum). A few years ago, a separate research group posited that the hominin fossils at Malapa belonged to two different species—in part due to differences in their lumbar vertebrae. However, an analysis by Williams and colleagues indicates that both are from A. sediba and that distinctions are due to age.